When preparing your facility for ultrasonic cleaning there are a lot of decisions you need to make in order to create a space that is efficient and allows you to more quickly realize profit. Here are a few things to consider. 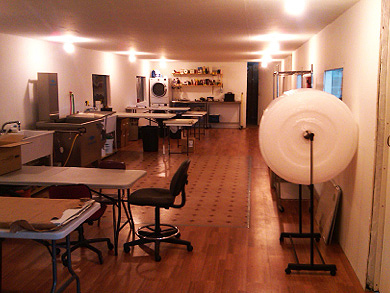 A Morantz customer’s facility with the SM-200 Super System, Drying cabinet, tables, and more. This space was optimized for equipment and work flow. 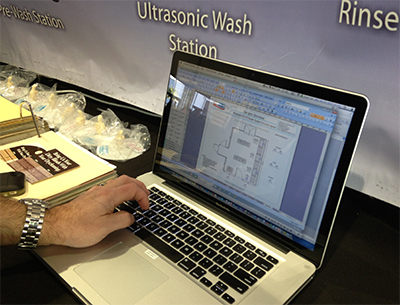 Space planning starts with figuring out the goals for your ultrasonic equipment and your business. If you’ve already established your goals, then you’re in a great position, but even if you haven’t, there are some basic questions you should ask yourself. What do you plan on cleaning? Is your goal to become a specialist or a cleaning “hub” for a specific type of item in your area? Or, are you just trying to clean items more quickly and easily? Are you expanding your services? Does your business do something other than cleaning? For example, are you a manufacturer who needs a better way to clean parts and components? Are you looking for an alternative method for maintaining equipment? 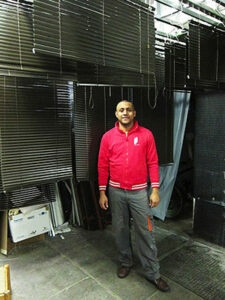 Do you plan to work primarily from your facility or will this be a mobile business? Having a plan for operation is critical. If most of your work is done at a customer’s site, how you approach planning your facility will be different than if most items will be brought to your facility for processing. Are you a new start up? Do you have existing cash flow? Are you an established company making a planned investment? An example of how many companies begin. This is a photograph sent to Morantz from a customer to begin the process of facility planning. How you use your space depends on your goals and the type of company you are. 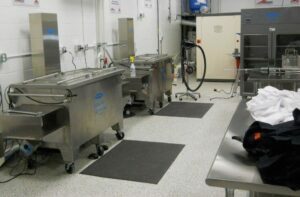 If you are an established company with a goal to diversify services and grow Ultrasonic Cleaning as a major division or department, more equipment may be necessary as well as space. Most likely you will need a defined workspace that may require at least 500 square feet. This not only includes space for equipment, but for storage of both dirty and cleaned items, racks for drying, tables for packing/unpacking and more. If you are a newer or smaller company, it may be necessary to minimize the space you use. Being nimble and flexible will help with cash flow and allow you to maximize your profits. Your strategy should include some planning for future growth. That means you need to decide if you want to reinvest income in additional space and/or more equipment. The following are additional factors that you need to consider. These factors will also help you determine the equipment that may work best for you in your current circumstances. Know the service your facility currently has installed and determine whether that service can be modified (if needed). For example, most Morantz Ultrasonic Systems are available in 110v and 220v models and typically require a 20amp service. What electrical current do you have available? Do you have 110v, 208v, 220v or a combination? How many separate circuits do you currently have? What electricity are you willing or able to install? Will you need a landlord’s or other approval to make modifications? Water is the cleaning medium for Ultrasonics. 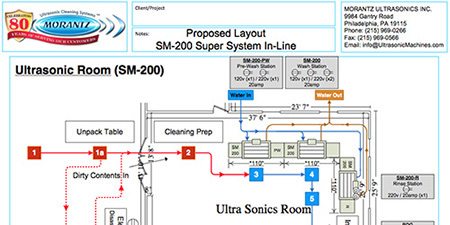 Specifically, Ultrasonics requires soft water to achieve it’s most effective cleaning. Is your water source city or well water? Is the water hard or soft? Will you be working primarily on-site (using your customer’s water)? It’s not uncommon for facilities to have hard water. Fortunately, it’s easy to soften hard city supplied water with Morantz products. 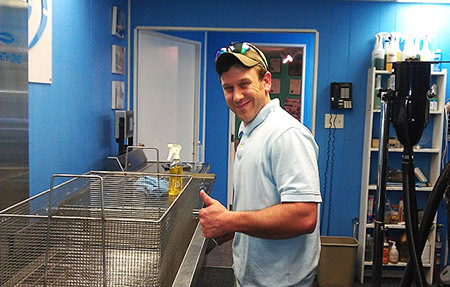 For a variety of reasons, well water is not a good medium for ultrasonic cleaning. This may require installing a water softening system or utilizing outside water. This is something you want to plan for, not be surprised by later. You want to be able to fill your equipment and drain easily. This can be as simple as using a hose to fill the machine(s) and opening the ball valve drain on each machine for drainage. DO plan to use separate hoses to drain your tank(s) than you use for drainage. The inner surfaces of drainage hoses can be contaminated, and you want to fill your tanks with clean water. DON’T become paralyzed to move forward due to a perception that you can’t start offering the cleaning service if you don’t have the filling and draining of the tanks perfectly planned out. Start simple. If you would like to install more permanent fixtures throughout your facility for filling and draining, great. Sometimes it’s best to wait until you have your equipment in the place you want it before making these installations. Give yourself some flexibility and see what works best. Do you have access to hot water? Do you have enough hot water to fill your equipment? If you don’t have hot water, the machine will need to heat the water. Do you have enough time to heat the water before beginning work? Do you have all the right equipment to help you perform the work quickly and easily? Time is money and you need to be prepared for each job. While Morantz offers multiple accessory Kits designed specifically to help you get the job done quickly and easily, there are additional accessories that you may need to consider. Older Morantz machines include Morantz’s pneumatic lifts (as of 2017, most are electric). 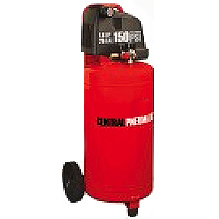 You will need to supply compressed air for the pneumatic lifts to operate, and for newer models, pre-wash machines still use air compressors for the bubbling action. When planning your space and electricity, don’t forget to consider what you may need to run your compressor(s). Also, many compressors are noisy. You may want these behind a wall, in a closet or case to muffle sounds. 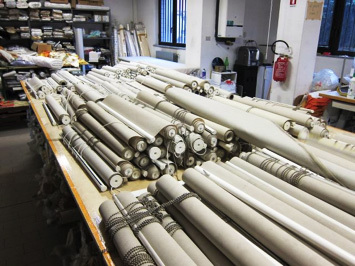 For most applications (including window blind cleaning, parts, restoration and contents cleaning), you will need a workspace to process items both before and after cleaning. This is where you will unpack and repack the items, prepare them for cleaning and inspect them for damage or unexpected contamination. Make sure you have space for the tables you are considering using. Most items will need to be packaged in some way after cleaning. You may want your packaging materials such as paper, plastic, bubble wrap and boxes over or near the tables. If you are not using the Morantz Pre-Wash or Rinse tanks, having a sink nearby can be extremely useful for many cleaning applications. 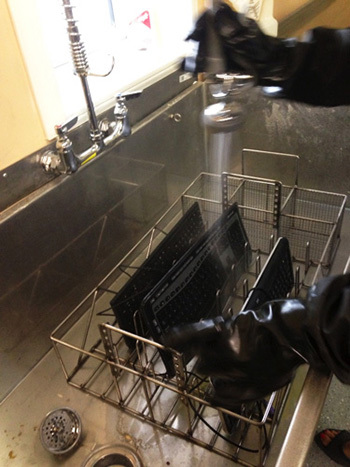 Consider having a sink large enough to fit the size baskets you are using with your machines. You will need to dry whatever you wash. While some items can drip or air dry, other items may need to be dried much faster. For quick drying, the Morantz Blow-Dry Gun is a great tool, but you may need to do a more thorough drying. In that case, the Morantz Drye Rite and Ozone cabinet can be a great solution.In some circumstances, you may want to build your own drying room. This will allow you to dry many large items at once. Regardless of your drying method, you will need to consider space, item placement, electrical and ventilation requirements. 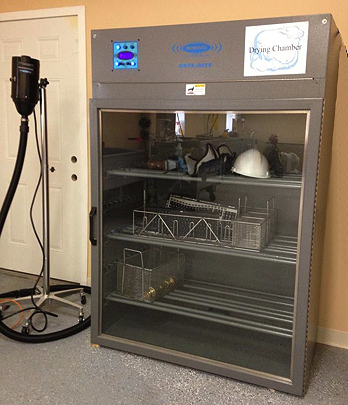 Pictured left is the Morantz Blow Dry Gun and right is the Morantz Drying and Ozone Cabinet. Both tools dry items within minutes. An area to hang and dry blinds, curtains, area carpets and more may be necessary depending on the service you are providing. 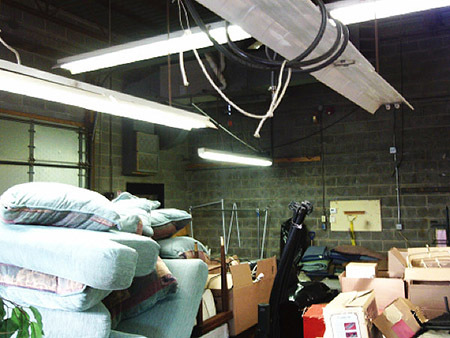 Will you be storing items after cleaning? If so, will you need to store items for the short or long term? 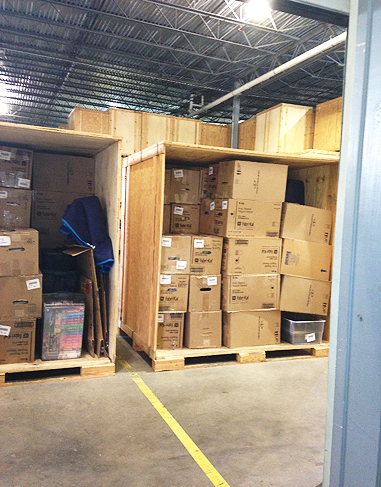 If you don’t have storage space available, you might want to consider off-site storage. Whatever your storage decision, be sure that the items are stored in a safe and climate controlled facility (if necessary). Crates/Vaults used primarily for storing contents from fire and water damaged items. The abovementioned questions are critical to allow you to efficiently plan your space. The more prepared your space is, the faster you can process jobs and realize a profit. We can also assist you with Best Practices and provide guidance to your organization. Please be sure to discuss your goals with your Morantz representative before ordering your equipment. We want to help your company make informed decisions and plan for your growth and success. And don’t forget; this is a free service to our customers. We want your space planning to be quick and easy, but in order for us to help you, there are some things that you can send us to help speed up the process. These items will also help us figure out and make suggestions about what equipment will work best at your facility, maximizing workflow and account for additional items you may need to install. Please be thorough and note locations of existing doors, electrical outlets, conduits, plumbing, drainage and water sources, fixed structural elements and equipment or other potential obstacles that will have to taken into consideration. Yes, a picture is worth a thousand words. They also help us see exactly what we’re talking about and allow us to better understand your facility’s available space and existing layout. When taking pictures, wide-angle pictures of the entire space are preferred as well as close-ups of necessary elements that need to be worked around (i.e. existing fixtures, closets, etc.). If you want Morantz to help you plan your facility, or if you have any questions about planning, please don’t hesitate to contact us so we can discuss your needs and help you plan for success. We want you to profit from your equipment and receive your “Thumbs Up”.